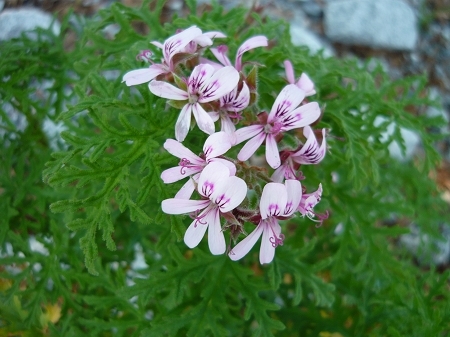 Candy Dancer Scented Geranium (pelargonium) Beautiful finely divided lacy green leaves have a pleasant mild rose scent. Robust upright and bushy growing habit. Small pink flowers when in bloom. Nice container plant but needs plenty of room as it will grow rather larger. Full sun, well drained soil. Perennial zone 11+ Live plant in 3 inch container.